REMEMBER my Christmas wish? Thanks to my brother's generosity, I have been able to satisfy my craving for the occasional Mexican tortilla or two, or three, to go with some of my Mexican specialties. Listen, I won't pretend that tortillas made with this dried flour are comparable in quality with the home-made tortillas that every Mexican prefers to eat at home, even though nowadays they're more likely to buy inferior tortillas from the neighborhood tortillería (tortilla factory) because, like us, they just don't have the time. 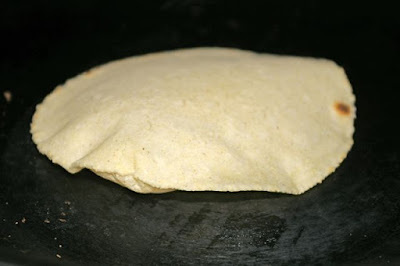 In Mexico, if you can afford it, you can always buy still-warm home-made tortillas at the local market, where many women go to earn a few extra pesos by selling the tortillas that they make at home from scratch. The other day, spurred by my success at the tortilla press, I made another of my favorite Mexican things: pickled jalapeño peppers. I always use Diana Kennedy's recipe straight out of The Essential Cuisines of Mexico, it's so perfect. 1. WASH the chiles, leaving the stems intact. Cut a cross in the tip end of each chile so the vinegar can penetrate. 2. HEAT the oil in a large, deep skillet, then add the chiles, onions, carrots and garlic, and fry over medium heat for about 10 minutes, turning from time to time. 3. ADD the vinegar, salt, herbs and sugar, and bring to a boil. Lower heat and simmer for 5 minutes for serranos and 10 minutes for jalapeños. 6. PACK 6 sterilized half-pint jars with the chiles, vegetables, and herbs; top with the vinegar and seal. These should keep for about one month in the refrigerator.